DragonNest Guide: Event: Magnificent Rewards with Magnifying Glasses! Event: Magnificent Rewards with Magnifying Glasses! The Bonus Magnifyque Chests event is back by popular demand for an entire week! From 14th to 22nd July, use a [Magnifying Glass] (Get them from the Cash Shop!) 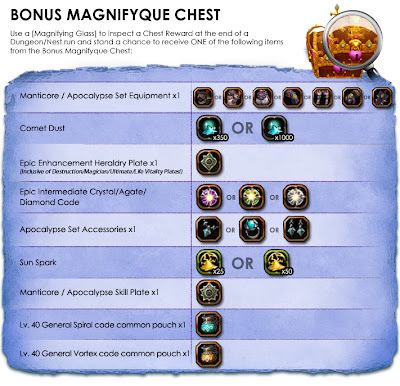 to inspect your Dungeon Chests at the end of the run and you’ll be rewarded with an item from the Bonus Magnifyque Chest for each [Magnifying Glass] used! *Note: All [Magnifying Glass] used on Friday, 13 July 2012, from 0000HRS onwards will also be counted in for the rewards offered in this promotion.